The Assayer (Italian: Il Saggiatore) was a book published in Rome by Galileo Galilei in October 1623 and is generally considered to be one of the pioneering works of the scientific method, first broaching the idea that the book of nature is to be read with mathematical tools rather than those of scholastic philosophy, as generally held at the time. 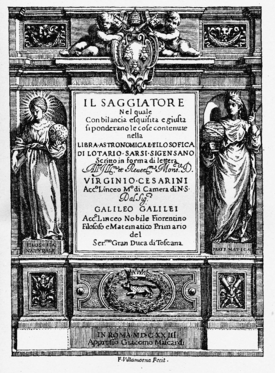 The context of the essay was to reply to the treatise Libra astronomica ac philosophica of 1619 by Orazio Grassi, a Jesuit mathematician at the Collegio Romano, which used the pseudonym of Lotario Sarsi Sigensano. The debate between Galileo and Grassi started in 1618, when the latter published Disputatio astronomica de tribus cometis anni MDCXVIII, in which he asserted that comets are celestial bodies. Grassi adopted Tycho Brahe's Tychonic system, in which the other planets of the Solar System orbit around the Sun, which, in turn, orbits around the Earth. In his Disputatio Grassi referenced many of Galileo's observations, such as the surface of the Moon and the phases of Venus, without mentioning him. Grassi argued from the apparent absence of observable parallax that comets move beyond the Moon. Galileo mistakenly believed that comets are an optical illusion. In 1616 Galileo may have been silenced on Copernicanism. In 1623 his supporter and friend, Cardinal Maffeo Barberini, a former patron of the Accademia dei Lincei and uncle of future Cardinal Francesco Barberini, became Pope Urban VIII. The election of Barberini seemed to assure Galileo of support at the highest level in the Church. A visit to Rome confirmed this. The Assayer is a milestone in the history of science: here Galileo describes the scientific method, which was quite a revolution at the time. The title page of The Assayer shows the crest of the Barberini family, featuring three busy bees. In The Assayer, Galileo weighs the astronomical views of a Jesuit, Orazio Grassi, and finds them wanting. The book was dedicated to the new pope. The title page also shows that Urban VIII employed a member of the Lynx, Cesarini, at a high level in the papal service. This book was edited and published by members of the Lynx. Galileo used a sarcastic and witty tone throughout the essay. The book was read with delight at the dinner table by Urban VIII. In 1620 Maffeo Barberini wrote a poem entitled Adulatio Perniciosa in Galileo's honor. An official, Giovanni di Guevara, said that The Assayer was free from any unorthodoxy. ^ Galileo Galilei, The Assayer, as translated by Stillman Drake (1957), Discoveries and Opinions of Galileo pp. 237-8. This page was last edited on 6 April 2019, at 12:29 (UTC).